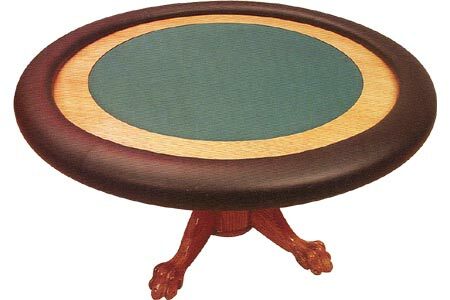 Our PT-5820 Poker Table features finished wooden legs and top edging, a removable padded armrest, and a padded felt playing surface. 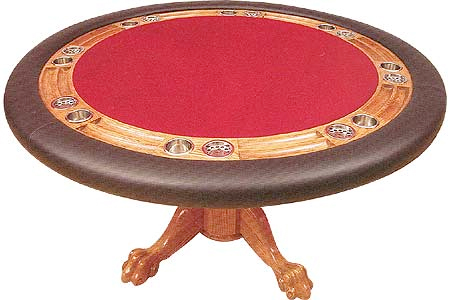 The unique "lions feet" that balance the pedestal base add a classic feel to this top quality poker table. Our PT35830 table is comparably equipped to the PT-5820 model, but it also includes built-in chip trays, metal cup holders and ashtrays for each player. The PT-5820 measures 54" in diameter by 30" tall, and the PT-5830 table measures 58" in diameter by 30" tall.